At the Grand Canyon Skywalk, tourists can pay about $90 to shuffle along a horseshoe of glass that extends over the rim’s edge, wearing special booties to avoid scratching the surface as they peer 4,000 vertical feet down at the Colorado River. For such a snazzy feat of engineering, you would expect an equally fancy visitor’s center: maybe a gift shop with overpriced calendars or a kitschy photo booth, but at least restrooms with running water and electricity. But no! Four years after the Hualapai Tribe opened the Skywalk, the visitor’s center remains a construction zone as legal wrangling with the attraction’s developer, David Jin, continues. In early March, the tribal corporation that runs the Skywalk declared bankruptcy to avoid paying Jin millions of dollars. And days earlier, the tribe seized another major tourism project from its non-native owners. The backhanded business maneuvers have tribal and outside observers worrying that future investors will be discouraged from doing business with not just the Hualapai, but tribes around the country. 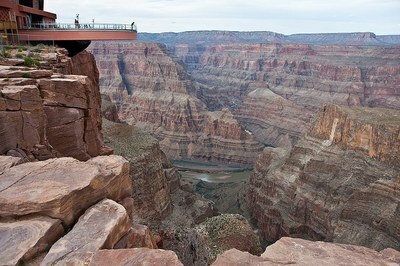 In 1988, the Hualapai opened Grand Canyon West, a new vantage point on the big ditch. The attraction was rustic, to say the least. "They bladed a dirt runway and took (tourists out in) a van, and they sat freezing at Guano Point and ate a meal out there," Sheri YellowHawk, former CEO of the tribe’s business arm, told HCN in 2006. Since then, tourism to Hualapai lands has steadily increased. Hoping to capitalize on the growing interest in Grand Canyon West, Las Vegas developer David Jin pitched the idea of a rim overlook in 1996. In 2003, tribal leaders partnered with Jin, who ponied up $30 million for the project, and agreed to split the revenue from the Skywalk for 25 years. But by the time the glass walkway opened in 2007, the two were already feuding over whose responsibility it was to complete the visitor’s center. The tribe tried to terminate Jin’s contract to operate Skywalk, arguing it was his fault the project was still a mess, and Jin sued to stop them. Tourists didn’t seem to notice the dispute, and flocked to the toilet-seat-shaped platform by the hundreds of thousands, netting the Hualapai more than $10 million in ticket sales to date. Relations between the developer and the tribe hit rock bottom in February 2012, when the Hualapai used eminent domain to seize the Skywalk from Jin. In exchange, the tribe offered to pay the developer $11 million — which Jin says is only a small fraction of what the attraction is really worth, and far less than he originally invested. This February, a U.S. District Court Judge dealt the Hualapai a blow when he required the tribe to pay Jin close to $30 million in lost revenue. The developer’s lawyers immediately went after the tribe’s bank accounts. “We're entitled to take every dime out of there until the judgment is paid," Jin’s attorney told USA Today. But the tribal corporation that operates Skywalk quickly declared bankruptcy, meaning its bank accounts are temporarily off-limits. In the meantime, a different tribal corporation will operate the Skywalk, which will continue to be “open seven days a week, year-round,” as the receptionist told me when I called last week. As the bankruptcy hit the news, the Hualapai quietly took over another tourism attraction on the reservation, an Old-West style town called Hualapai Ranch where, for $140 a night, visitors can “join the cowboys making S’mores and telling stories around an open fire” and “learn how to rope, quick draw, and tomahawk toss the cowboy way.” As with the Skywalk, the tribe enlisted non-native developers to build and run the ranch, which opened in 2005, and signed a revenue-sharing agreement. And as with Jin, relations between the Hualapai and the Brown brothers, who ran the ranch, quickly went downhill. The tribe terminated the Browns’ contract in December 2012, alleging that they hadn’t built sewer systems and water lines at the ranch, even though the contract explicitly recognized those things as the Hualapai’s responsibility. They then refused to meet with the Browns to talk about the alleged contract violations. Louise Benson, a former Hualapai chairwoman who is sympathetic to Jin, told USA Today that tribal leaders are “giving the Hualapai a terrible reputation that will injure the tribe for years. All over Indian country, I think this is bad." It’s pretty understandable why the Hualapai, or any Indian tribe, would want full control of a reservation revenue-generator. "Past development in Indian Country was the old formula where companies came in and built projects, but only leased the land and did not include the tribe as equity partners," David Lester, a member of the Muscogee Creek Tribe and the executive director of the Denver-based Council of Energy Resource Tribes (CERT), told HCN in 2010 in reference to a Navajo Nation proposal to build and operate its own coal plant. "That old paradigm left us with all the social and environmental costs and none of the economic benefits." Photo of Skywalk courtesy Flickr user stefanhaubold.